When we first moved out of our parents’ home, our Christmas tree was practically bare. We had the few ornaments we’d collected as kids, but we hadn’t yet amassed a big spread like the ones our moms proudly displayed from decades of collection every year. It was all okay, though, because our DIY skills saved the day and our tree was far from bare! Instead of going out and buying lots of ornaments we couldn’t afford, we made our own Christmas garlands to cover more space and we were so happy with how it looked on Christmas morning! Just in case you’d like to follow suit, or even if you’re just looking for fun seasonal Christmas crafts to make with your kids on winter break, here are 15 lovely DIY Christmas garlands that will jazz your tree up completely! The best thing about making your own DIY Christmas tree garland is that you can do it from the simplest things, and if you’re a DIY enthusiast like us, you probably already have those things in your home somewhere! 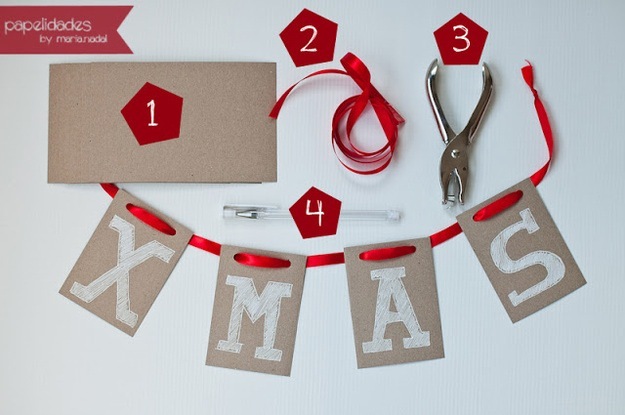 We love the way Papelidades cut simple rectangles of cardboard and wove a pretty, thick red ribbon through the top, drawing letters on each piece with a white gel pen or marker. People who enjoy felting are never at a loss of crafting options when it comes to simple things like DIY holiday decor. Even if you’re very new at the art, you’ve probably already got the skills you need to make basic shapes, and even the easiest ball can help you make a cute garland. 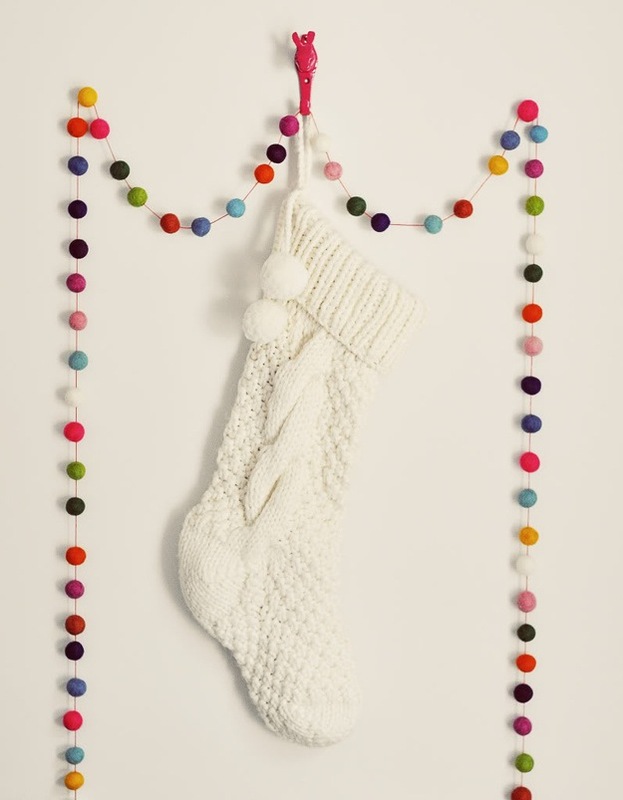 Check out how My Sparkle string these adorable, brightly coloured felted balls together to make a cheerful garland that looks nice anywhere (and is versatile enough to hang up the rest of the year too). Do you live near an affordable craft store or a dollar store that sells plain metal bells in their Christmas aisle? Then grab a few packages and follow the steps outlined on Cozy Cottage Cute to string them along a thing piece of jute rope. 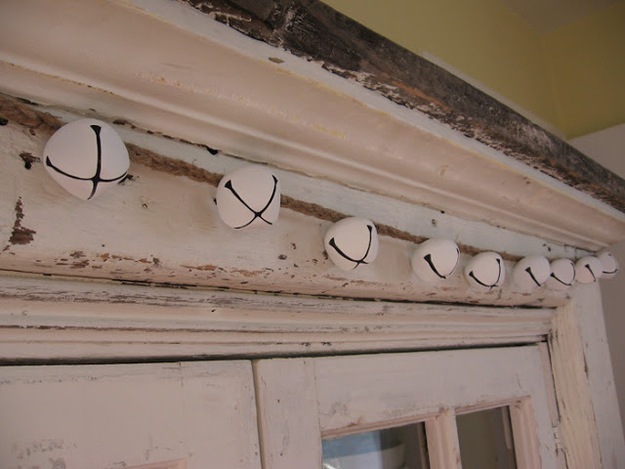 Before you string them, though, try painting them a pretty cream or off white colour to give them a vintage look. Some people might just see place setting pieces when they look at paper doilies, but to crafters like us they look like endless DIY possibilities! We love the way Cake saw garland potential in the paper lace, folding them in half over a string so they can drape across the Christmas tree or the wall ever so delicately. 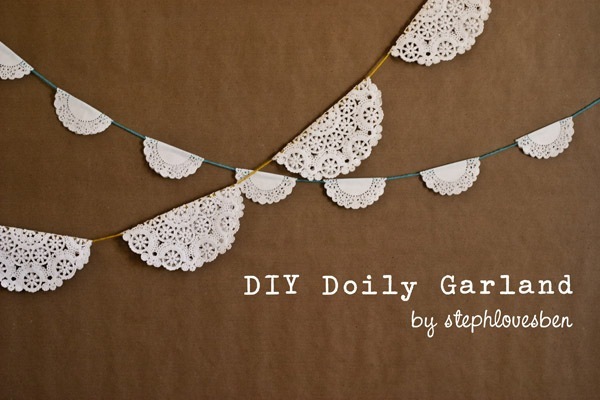 Do you like the idea of a simple, affordable paper garland but your Christmas decor is a little more funky and you’re not sure lace will really fit the aesthetic? Then try this paper cupcake liner idea instead! Le Fru Fru suggests using glitzy papers that are brightly coloured or have some sparkle and shine to them to make the look especially interesting. This one’s also easy to make with kids! If you’re an avid scrapbooker then you probably already have hole punchers in all kinds of shapes, but if not, you could cut a shape for your paper garland carefully with small scissors instead. We love that, instead of regular coloured paper, Grace and Light Studio chose to use paint chips so they could create perfectly colour coordinating garlands by sewing through the middle of each using a needle and thread. 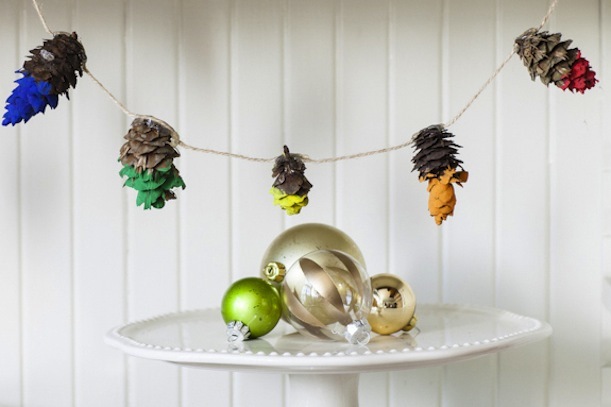 Who says you have to keep things traditional when it comes to Christmas garland? Half of the real ornaments we own are already themed around other things we enjoy rather than Christmas itself, so why not make yourself something a little more novelty? 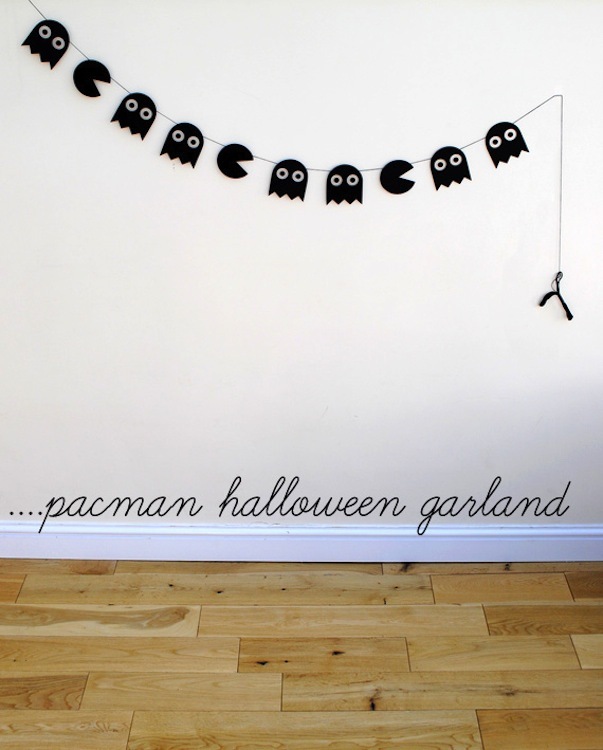 We can’t get over how cute this Pacman garland by Minie Co is. Check out their tutorial to see how they made the shapes. 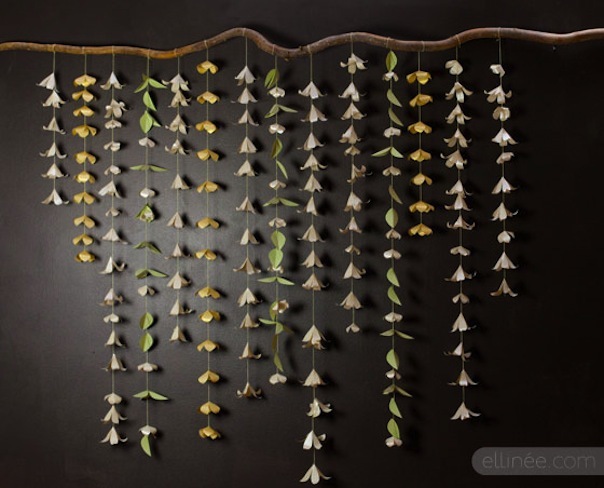 Maybe you’d rather make yourself a garland that hearkens back to warmer days, just to keep yourself cheerful through the colder season? 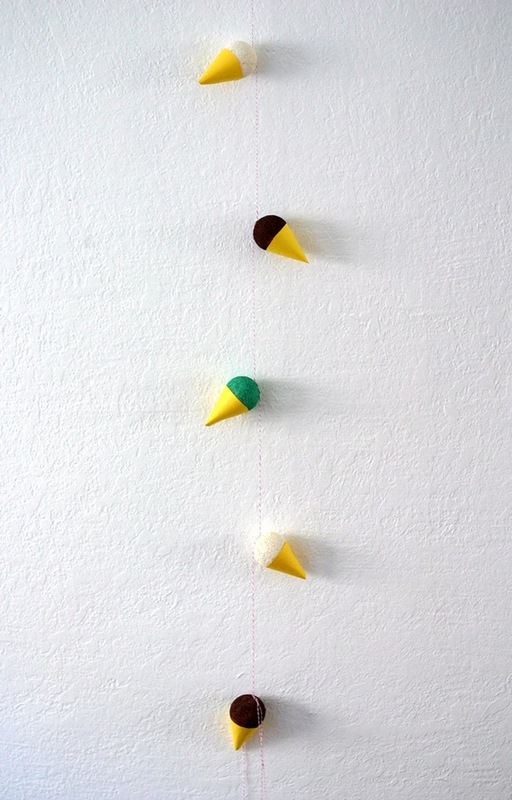 We think the idea of making yourself an ice cream themed garland is adorably ironic. Check out how Hello Lately made this one using paper cones and coloured pom poms for the ice cream tops! 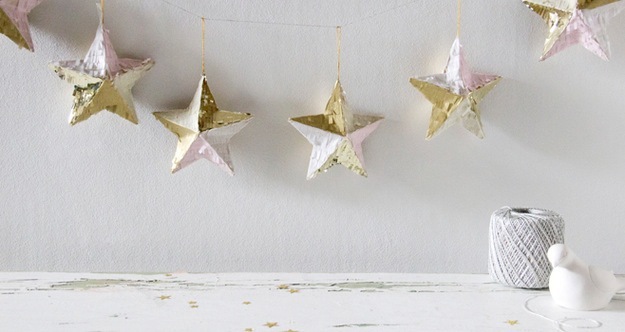 Have you always loved stars the most about Christmas, taking great pride in placing one at the top of your tree every year when you’re finished decorating? Then try taking that theme and running with it, decorating the rest of the tree or your walls to match! Confetti Pop guides you through the process of building your own shiny stars and stringing them together just like the picture. Are you a sewing enthusiast who’s been looking for projects that will teach your kids the basics of your favourite craft? Combine that lesson with making your very own Christmas garlands and help your kids create these adorable little leaves! A Beautiful Mess shows you (and them) how to thread a piece of yarn through holes cut in each leaf using a blunt darning needle. It’s the perfect learning project! Perhaps you’re just looking for a fun, cheap way to add pops of colour to your tree and make the place a little more patterned and cheerful? 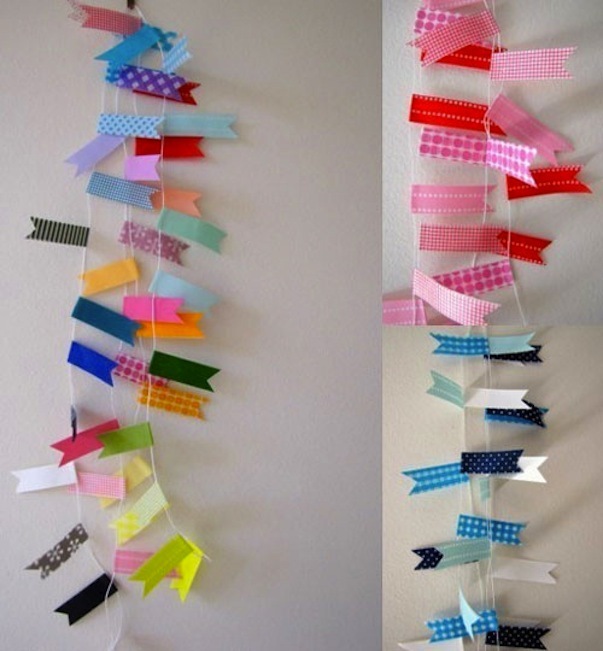 Then all you really need is washi tape and string! Gather your favourite colours and patterns and carefully wrap strips around a subtle string or thread all along in a colour gradient or randomized. 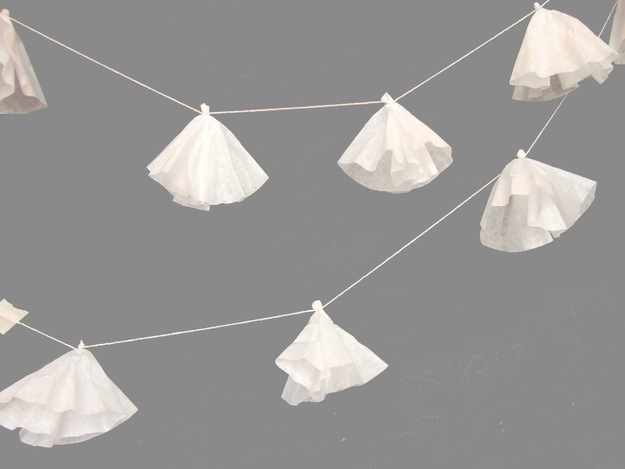 We love the way Poppytalk cut litttle notches in each so they look like bunting flags! Are you a big fan of surrounding yourself with not just the people you love during the holidays, but also the things? Well, even if you’re not actually going on a holiday trip, there are cute, easy ways that you can show your love for jet setting and travel even just in your simple Christmas decor! 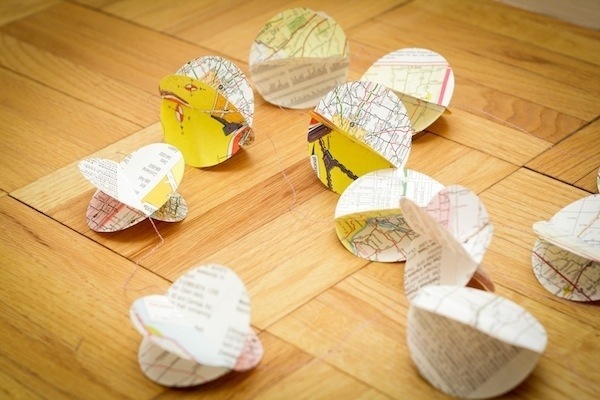 One of our favourite ideas is this cute little 3D garland made of sections from an old map. Blog a La Cart guides you through the process of building the circles by making cuts in the paper and sliding them together in the middle. Maybe you’re just looking for a way to decorate the tree very simply or keep your kids busy while you cook in preparation for family to come over? Then all you really need are coffee filters and some string, thread, or yarn! A Daily Something suggests pinching them in the middle at the bottom and tying the thread there so the filters hang down like little white blossoms. If you have lots of trees near your house then you probably have just about everything you need to make this brightly coloured winter garland already! Say Yes shows you how to string them along like a garland once they’re dry, but our favourite part of this idea is dipping the ends of them in whatever colours of paint you love most. Have you made other types of DIY Christmas garland before that you were very happy with but that you don’t see on our list? Tell us how you did it or link us to pictures of your work in the comments section!